← National Parks need our help! Driving along a section of Route 66 from Joshua Tree to Grand Canyon last April, we stopped at Roy’s Motel and Cafe in Amboy, CA, hoping to get a bite to eat. Unfortunately the once motel-cafe-gas station-auto repair shop only operates nowadays as a gas station. With its iconic road sign, Roy’s is a reminder of a pre-interstate US. 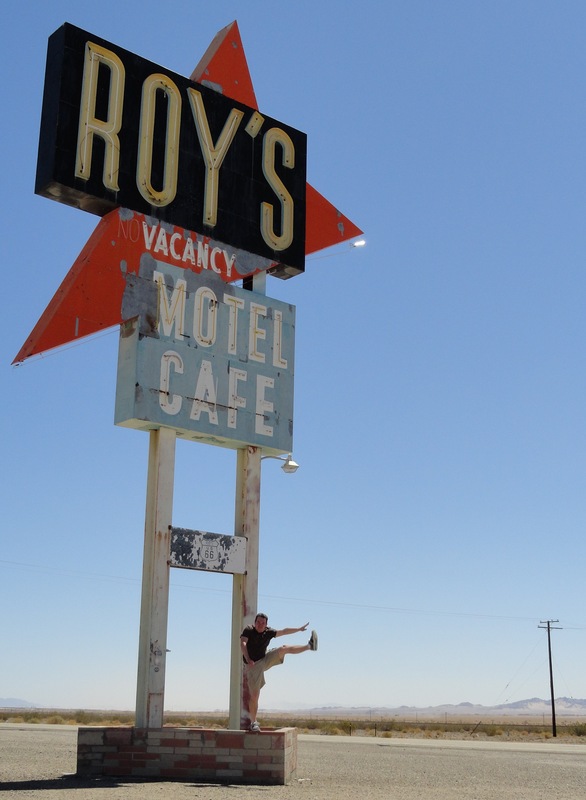 Roy’s opened in 1938 as a gas station along Route 66 – then the primary route for anyone traveling from Chicago to Los Angeles. The complex grew over the years and by the 1950s employed over 70 people (in a town of 700 at the time). When I-40 opened in 1972 – bypassing the area – business declined, turning Amboy into a ghost town (current pop. 4). In 2005 preservationist Albert Okura bought the entire town, promising to restore Roy’s to its former glory. Here’s hoping. This entry was posted in High Kick Photos and tagged Amboy CA, High Kick, Roy's Motel and Cafe. Bookmark the permalink.